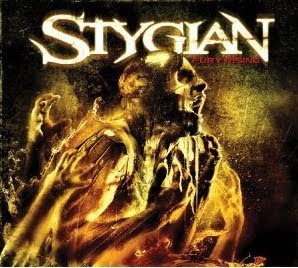 Hall of the Mountain King: Review: Stygian, "Fury Rising"
On first listen, I thought I was going to really like Stygian’s Fury Rising. You see, I have this weakness in the eyes of many, and that’s the fact that I actually enjoy some of the more commercial acts like Godsmack and Disturbed. Though they have some aspirations to something a little heavier, that’s really the realm where Stygian fits. Unfortunately for me, that feeling I got on the first listen didn’t last over the course of the next few plays. The band began life as a Metallica cover band, and it won’t take you long to figure that out. Whether it be vocalist Frank Leary doing his best to imitate the worst of James Hetfield’s yodeling attempts to sing toward the end of album opener “Suffer Patiently” or guitarist Patrick Hayden’s lead ripped right from the “How to Play in the Style of Kirk Hammett” instructional video on the same song. Then there’s the ballad “My Regret,” which offers a carbon copy of some of the worst that the Metallica catalog has to offer, and the painful vocals on “Unstrung Hero,” which sound like someone trying to do Hetfield karaoke. Despite that, though, there are moments in most of the songs that I actually like. The title track opens with a nice squealing riff that shows promise. After that, though, things go off the rails. It’s like there’s no connection, chemistry or spark in the song – almost like the parts were recorded in four different studios in four different towns and then patched together. “Crimson Sand,” after a Godsmack-flavored opening riff, suffers the same fate. The dry, squeaky clean production doesn’t help matters either, as individual instruments, particularly the guitar, sound very good alone, but when taken together it seems a bit sterile – kind of like Metallica’s Load, now that I think about it. Much of this record seems to be dedicated to recreating the Load era, though why anyone would want to do that, I have no idea. There are interesting moments scattered throughout – the Alice in Chains-flavored vocal bit and faux-exotic guitar licks at the beginning of “One More Shot” and the twangy guitar at the beginning of “Last Redemption” – but instead of following those threads, the band always reverts back to Load mode. Toward the end of the record, we finally get some relief. “The Fear” opens with a cool thrashing riff, but Leary’s Sully Erna impression falls short of the original and still has too many heavy Hetfield inflections. “Glass Legacy” sees the infusion of some power metal influence. It scales back the Metallica worship (though it’s still there) and reminds me a bit, at times, of Iced Earth. It’s the first real sign of life for a full song on the record. Album closing ballad “Fever Slide” loses the momentum, though, despite some nice Alice in Chains-infused moments and a really cool piano and Spanish-flavored guitar run at the end that save it from being another Metallica copycat ballad. I think there’s a great deal of promise on Fury Rising, but, in truth, not much fury. I can find some good point of just about every song here (with the possible exception of “My Regret”), but the band absolutely has to find its own identity. Right now, they’re a copycat that’s not even copying the best era of Metallica. If you’ve ever wondered whether or not you would have liked Load if it had been another band instead of Metallica, one listen to this record will give you the answer: No.